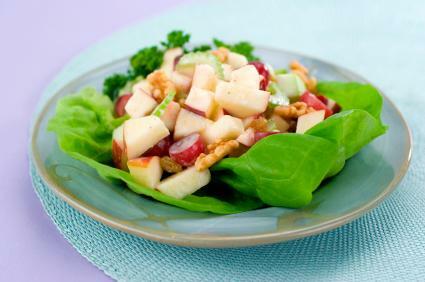 Created by Oscar Tschirky, the Maitre d' of the Waldorf-Astoria in New York City in the 1890s, the Waldorf salad is a refreshing and fun salad. There was at one time a British television show called "Fawlty Towers" featuring John Cleese of Monty Python fame. Mr. Cleese played the part of Basil Fawlty, the proprietor of the beach side hotel called Fawlty Towers. In one memorable scene, and there were innumerable memorable scenes, a guest requests a Waldorf salad to which Basil Fawlty replies "I'm sorry you cannot have one, we are out of Waldorfs." Suffice to say that there are actually no Waldorfs in the Waldorf salad. There are, however, walnuts. When choosing your walnuts make sure that they are fresh. Each walnut should seem heavy for it's size and not rattle when you shake them. Since we are using only one ounce of walnuts, and that is one ounce of shelled and diced walnuts, you will only need a large handful or two of whole, unshelled walnuts to start. If you are not so inclined to start shelling and dicing walnuts, please feel free to buy a bag of walnut pieces, this will work just as well. An ounce of chopped walnuts is about three tablespoons. Since this is a mix recipe and does not involve cooking, you can add more walnuts if you like. Whether you have any Waldorfs on hand or not, this salad is really quite simple to make. I like to lightly toast the walnuts before adding them to the salad, but this is not necessary and, in fact, is not the original way the salad was served. I like to toast the walnuts because they then add a smoky flavor to the salad. To toast your walnuts, place them on a half sheet pan or a cookie sheet lined with a sheet of parchment paper. Preheat your oven to 350 degrees and bake your walnuts for about five minutes. Not much longer than that since light toasting goes a long way here. Taste for salt and pepper and lemon juice.